Um…if I need a Halloween costume? Those are often the justifications that you’ll hear for the resentment towards thrift stores. Some people feel that thrift stores are for low-income individuals and telling people you shop at Goodwill lowers their status amongst their friends. Others find stores too dark and unbearable with the amount or quality of products on the thrift store floor. We get it. Some thrift stores are not fun to play in. However, if your willing to spend some time to save a dime, you might be in for some fashion finds and deals that will up your fashionista quo. The number one rule in thrifiting is understanding that you will have to dig to find your treasures. Often thrift stores organize clothing by size or simply color, which can make shopping all the more difficult. But don’t despair! We have put together this guide to enhance your thrift store experience and some tips to pass along about shopping with that budget in mind. See it all. You can usually find thrift stores in areas where there is low rent. But sometimes you can find them in places where upper class donors might drop off last season’s duds. Yes, you can find good quality Jimmy Choos in a Manhattan thrift shop. Do the search and know where the more quality clothing can be found. Go on a thrift shop tour and learn what these stores stock up on. Know the deal days. Several thrift stores run specials throughout the week, where they will have 50 percent or even 70 percent of items in their store. Usually, these are the busiest days of the week for a thrift store. Others might use the color tag or calendar deal system. Always know what’s on sale when you walk in. Get creative. Finding good clothes can be hard, but what is great about thrift stores that they almost lead to the most unusuable but fashionable buys. Examine what you find and compare it to what’s currently in your closet. Think abot the creative ways you can incorporate your thrift store finds. Maybe it’s an old pair of jeans that you can retro out into some funky high-waist shorts. Don’t forget that you can DIY to objects you find in the thrift store. And it will cost you a lot less than tearing up some 7 for All Mankind jeans. This may be the time to enhance those sewing skills. Quality exists. Know that. Usually branded items are recognized and might cost a little bit more than your average-joe designer. But it’s always a better deal than you realize so don’t be afraid to take off on the scavenger hunt to find those precious items. Check out accessories. These are probably the best items you can get from the thrift store because they are usually super cute, unusual, and cheap. Up your jewelry collection, which can almost always be the best way to stand out from the crowd, by glimpsing through accessories at the thrift store. It’s almost unbelievable the things that you can find. 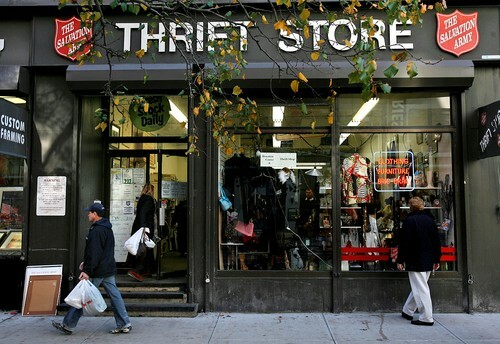 Want to know where the best places to thrift shop at? Your local Goodwill, Salvation Army, and OxFam might have some selections (and all of the proceeds go towards good causes!). But if you’re interested in finding out what’s in your area visit TheThriftShopper.com. It’s the largest directory on thrift stores nationwide. Savers and Plato’s Closet are also other well-known shops, whereas Atlanta and Columbus’s Rag-o-Rama always gets good reviews but at a slightly higher price. Now ready for a challenge? How about thrifting for a month (or two depending on your shopping habits) and showing Liberette that you’re a true fashionista? If you can ride out the challenge we would love to see what you find and feature you on our site. Just hit us up in the contact page with your details. We want to see your style! So, start your thrifting challenge and share your results with us! We can’t wait to see what you’ll find.